Folded? Die-cut? Diorama? It's fun and easy with this collection of three different Premium Downloads. 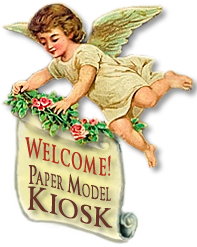 Say"A Merry Christmas" witha Mistletoe Christmas Card, a Mistletoe Die-cut Christmas card, or a Mistletoe Christmas Diorama. TheMistletoe Christmas Card Collectionoffers three special cards at a special price as well as somany possibilities to be creative. The Mistletoe Christmas Card — just print, trim, and fold! 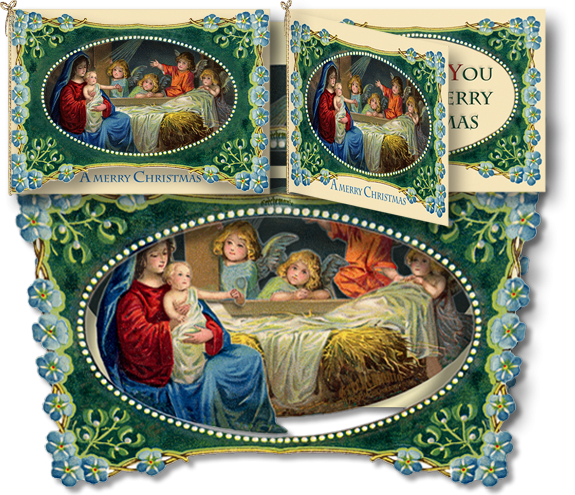 The Mistletoe Christmas Die-cut Card—create a vintage die-cut look by trimming the area around the posies, and creating an oval that frames The Nativity. The Mistletoe Christmas Diorama— it's so simple to make — six layers spaced apart by styrofoam — that you won't be making just one. But you'll make sure to keep a diorama for yourself! You know you won't be able to stop at making just one of these delightful cards, so why not by the whole collection — and save? Size: 5.75 x 3.25 inches.